For our second video card driver update of the week we have AMD, who is releasing their Catalyst 14.6 beta drivers today. Like NVIDIA’s driver release, this is first and foremost AMD’s launch driver for Ubisoft’s heavily promoted open world techno thriller, Watch Dogs. For Watch Dogs AMD has put together a number of performance optimizations, including single-card optimizations that can offer 25%+ performance improvements in AMD’s internal testing, and also the necessary profiles to enable Crossfire support. Meanwhile this driver also contains a number of optimizations and will be the launch driver for AMD’s own upcoming showcase title, Murdered: Soul Suspect, which is being released next week. Coupled with AMD’s performance updates however are a number of UI/feature updates that are being rolled out in this new driver branch (14.200). Among these changes are Mantle updates, major Eyefinity improvements, and expanded color control capabilities. 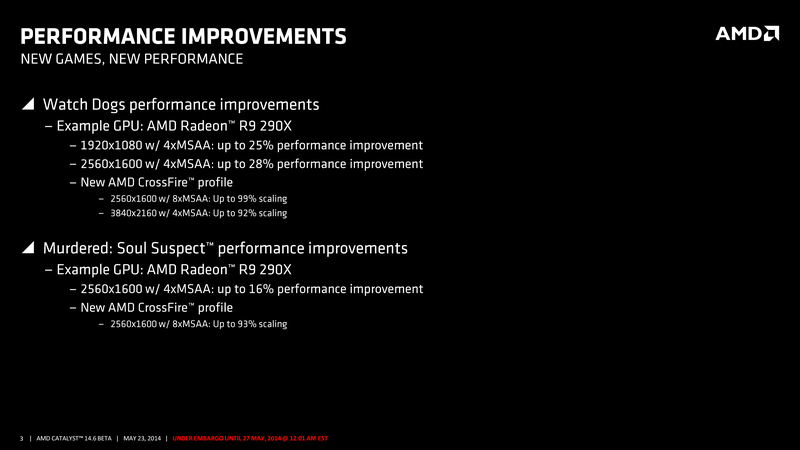 Starting off with the Mantle changes, AMD laptop users will be pleased to hear that Mantle has finally been enabled on Enduro configurations. Since this driver was delivered over a holiday we haven’t had the chance to look at Mantle support on Enduro in-depth, but with AMD slowly but surely improving both Enduro and Mantle we have high hopes for this. Meanwhile Mantle multi-GPU support has also been enabled for Thief, as Thief itself now supports Crossfire with Mantle. Bigger are AMD’s Eyefinity updates, which marks one of the biggest updates for the technology since it was first introduced almost 5 years ago. While Eyefinity has always been fairly lenient about what monitors it will work across – easily working across mismatched monitors (unlike NVIDIA Surround) – it has always required that the monitors all be set to the same resolution. In a mixed resolution setup this limited Eyefinity’s functionality somewhat, particularly when it comes to image clarity since a mixed resolution setup would require that one or more monitors run at their non-native resolution. 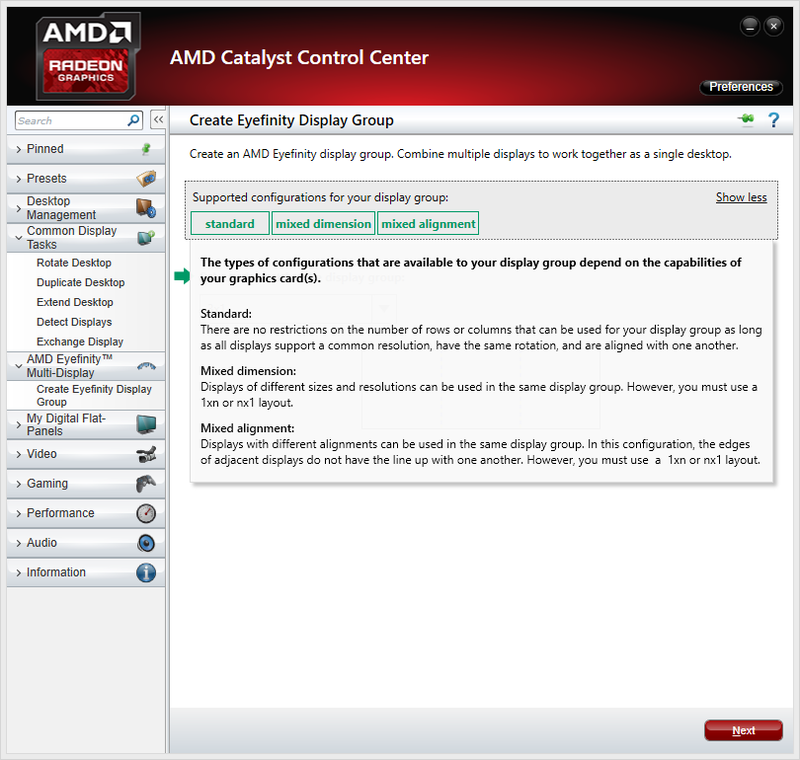 Starting in Catalyst 14.6 AMD has enabled mixed resolution support, allowing for a single Eyefinity display group to be created while each monitor runs at a different resolution. This feature is made possible through the addition of two new Eyefinity display modes, Fit and Expand, which join the traditional Fill mode. In both Fit an Expand mode AMD is compensating for the mismatched resolutions by creating a virtual desktop that is of a different resolution than the monitors, and then either padding it out or cropping it as is necessary. In Fit mode the virtual desktop used is based on the largest common resolution that all displays support, with the larger displays using a padded image to make the virtual desktop fit accordingly. Meanwhile in Expand mode the tables are turned and the virtual desktop resolution is based on the largest monitor, with the image being cropped to fit on the smaller monitors. Expand mode delivers the largest resolution at the cost of having some image data cropped off, while Fit mode offers the best compromise resolution. Or if neither works, then traditional Fill mode can be used and every monitor is driven at the same resolution. These functionality changes are exposed through a revised Eyefinity UI that is designed to simplify the creation of Eyefinity groups. 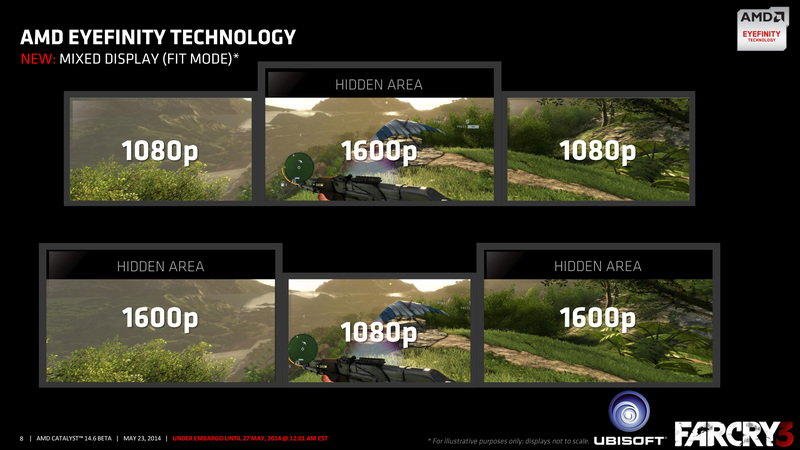 With their latest UI AMD is gunning for “one-click” Eyefinity creation, and while mixed resolution setups still require a longer setup process to arrange the mismatched monitors, identical resolution monitors are indeed much easier to setup since they can immediately default to Fill mode. 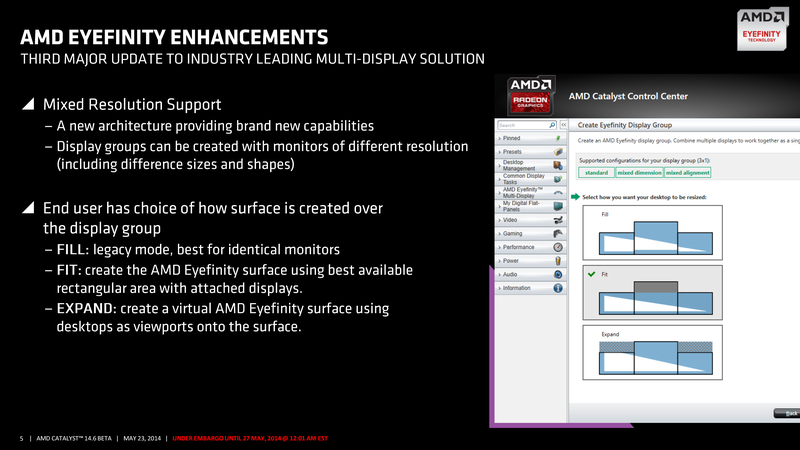 As for mixed resolution setups, AMD’s new UI offers a new alignment mode to help arrange the monitors, allowing customized alignments and preset top/center/bottom alignments. Based on our limited testing of Eyefinity in 14.6 AMD looks to have everything in working order. Both mixed resolution and identical resolution setups are working well, though it takes some time to get used to mixed resolution setups once you throw in bezel compensation into the mix. However we would note that users hoping that mixed resolution Eyefinity will bring Portrait-Landscape-Portrait (PLP) support are going to be out of luck. 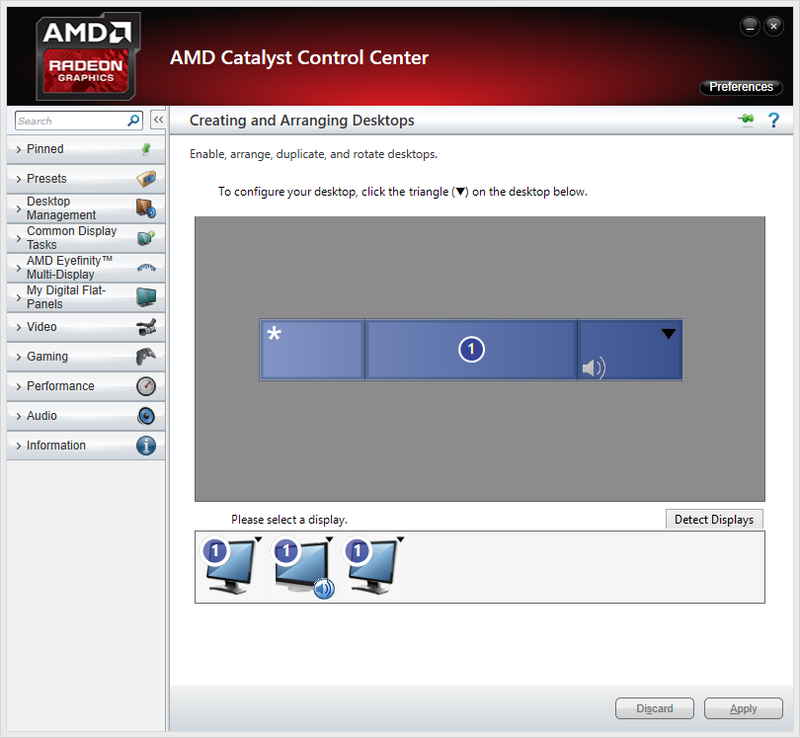 AMD’s rotation abilities are still based on the virtual desktop instead of the monitor, so there doesn’t appear to be a way to make PLP work since not all monitors need rotation. 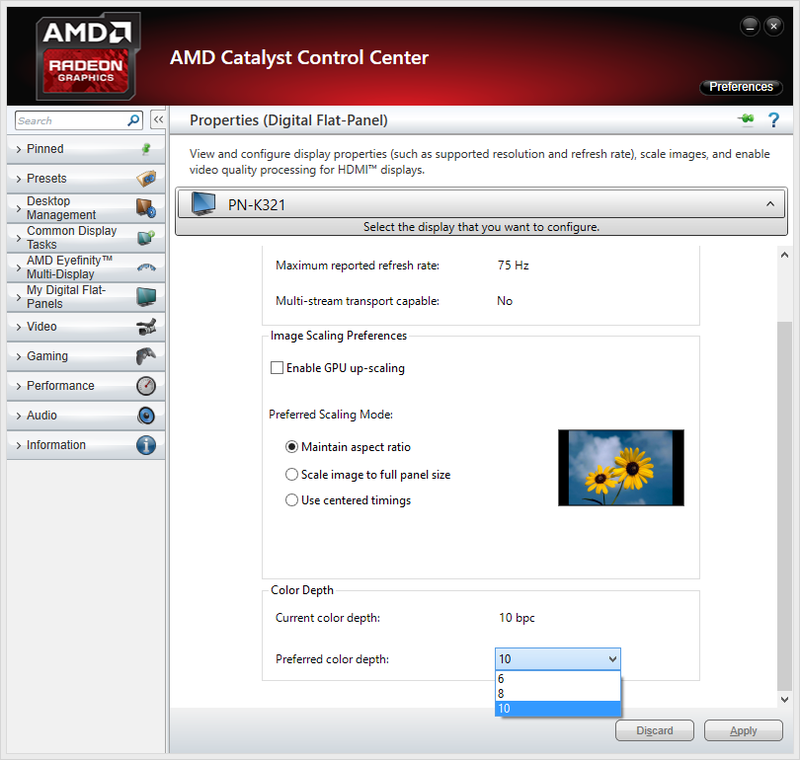 Up next, AMD has added some interesting new video color and color depth management controls for their drivers. We won’t get too deep into these (ed: deep color, I get it! ), but on the video color management side AMD now allows for per-color controlling of boost and hue values. Meanwhile in Digital Flat-Panel properties AMD now allows for the panel’s per-channel color depth to be selected on monitors and display connections that support it. In the case of our Sharp PN-K321 for example, we can now choose between 10bit per color, 8bit per color, and 6bit per color settings. Most users should be fine with the default settings, but prosumer/professional users should find this functionality handy. Elsewhere, Catalyst 14.6 also brings expanded support for AMD’s hardware JPEG decoder, which is available on some of AMD’s APUs. 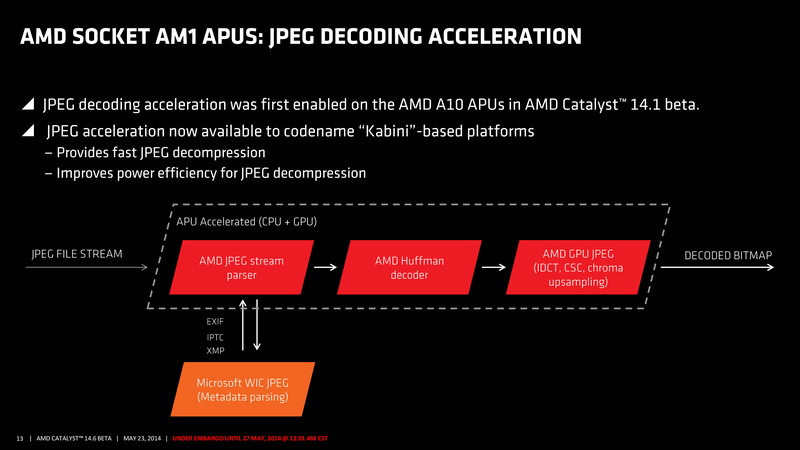 The hardware decoder is now available on AMD’s AM1 “Kabini” APUs, where the lower performance of these products should make the gains from the JPEG decoder more palatable. Finally, AMD has also included a note that Windows 8.0 users will want to pay attention to. AMD is dropping support for Microsoft’s non-updated version of Windows 8 early; while Microsoft will be supporting Windows 8.0 until early 2016, AMD has ceased support for it as of Catalyst 14.6. Realistically speaking we expect that AMD’s drivers will still work if forced, but officially AMD no longer supports the OS and has removed the NT6.2 entries from their INF files. Wrapping things up, as of press time AMD has yet to post the 14.6 drivers to their website (Monday being a holiday in the US), so users looking to get an early jump will have to wait just a bit longer. But once they are posted they should be available from AMD’s Catalyst Beta page. Is Catalyst 14.6 up yet? When I click the link, it still says Catalyst 14.4. That sounds right from the fit description. What's the point of using Fit mode over Fill tho? I'm sure there's one or they wouldn't have bothered... Wouldn't you rather ALWAYS use more of your display space tho? I guess there's games that might not play nice with Fill and you'd end up with hidden game elements, which would be particularly bad if it's UI elements that are now completely inaccessible. Actually it worked even on older drivers, but you'd had to add some registry entries manually. After a test I can say: That option changes absolutely nothing.